A Quote-Don't tell me what you can't do, tell me how you're gonna fix it. 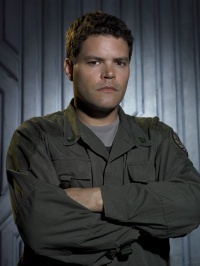 Chief Petty Officer Galen Tyrol, is a much-admired NCO aboard the Galactica. He served aboard Battlestars from the age of eighteen, including the Battlestars Columbia, Atlantia, and Pegasus . He has served under William Adama for a number of years, and has considerable respect for the Commander - a feeling that is reciprocated. Indeed, he admires Adama to such a degree that he has modeled his own style of leadership on that of Adama: firm, fair, and willing to go to the fullest degree in support of his crew. However, when people under his responsibility are injured, threatened or killed, Tyrol becomes rather irrational, angry, and reckless in his actions, to the point of further endangering his people or his reputation with senior officers. Prime examples of his lack of emotional control includes the ship venting after the nuke hit and cursing Tigh in front of Commander Adama for the vent and loss of 85 of his people, and saving a mortally-wounded crewmate while leaving himself and Cally highly vulnerable. Tyrol's tryst with Sharon Valerii and a subsequent cover-up attempt in resulted in the jailing of Specialist Socinus, who was trying to protect Tyrol. Originally leading Deck Crew 5, a team of 15 deckhands and specialists, since the Cylon Attack he has become the most senior and experienced NCO on the Galactica.